Yesterday I decided to give interval running a go. This isn’t strictly part of my training plan, which is entirely based on mileage, but enough people had recommended them as a way to increase fitness and build aerobic strength that I thought I’d give it a try. Interval training, for the uninitiated is where you run fast for a set period of time and then slow down and recover for a set period of time and repeat that pattern. This isn’t the first time I’ve tried intervals, I’ve done them before when I was using the adidas miCoach system to train for the Great South Run. That system coaches based on heart rate and for some reason, maybe the settings were wrong, I could never get my heart rate into the target zone. The result was that I would be running as fast as I possibly could with the miCoach shouting in my ear telling me to run faster. Not the most motivating way to train and I used to feel totally exhausted and deflated after the sessions, thinking that even though I’d run as fast as I possibly could I hadn’t done it ‘properly’. I began to absolutely dread the sessions and if ever I had to miss a session during the week, guess which one it would be? Then the other day one of my fellow Thinking Slimmer runners, Darin, posted that he’d been out and run an interval session. Another runner, Lynda, asked him if he’d heard of AudioFuel running music at different beats per minute that she uses for her interval training. I was intrigued. I love running to music and this sounded like a different way of trying intervals that I might enjoy. So I paid a visit to their website to have a look. There were two different types of interval training available. The first was a 22 minute pyramid training track where the intervals gradually increase in speed to a peak and then decrease again. The second was a 43 minute 3 step interval session where the intervals increased in speed 3 times to a peak, and then the pattern repeated itself. I listened to some of the samples available on line so I could get an idea of how it worked and decided to go for the 43 minute 3 step sesssion bundle which included 3 different maximum speeds to work through. This decision was based mainly on the fact that I would get further in 43 mins than in 22 mins and I still wanted to achieve the set mileage set out in my plan. So having downloaded the tracks I went out to try it out. I decided to start with the lowest of the speeds to see how I got on. Surprise surprise I really enjoyed it! The session starts with a warm up which is at quite a slow speed. There is a coaching voice over by Martin Yelling, which guides you through what to do. After the warm up the intervals start, these are counted in and Martin then helps you to find the right rhythm for each interval by saying 1,2,3,4 in time with the music. Throughout each interval he lets you know how long you’ve got left and gives you encouragement and advice on keeping good running form. I really enjoyed this aspect of the session. Before I knew it I’d completed the first of the 3 steps and was into the second. The bit that I found the hardest was actually slowing my speed down to the recovery speed suggested, it was slower than my natural ‘easy run’ and I had to concentrate quite a lot to find the right pace. The interval speeds themselves were achievable for me, which was encouraging. The final 3 minutes at 175bpm were definitely challenging, but not to the point where I felt I wanted to give up, I actually felt like I could have gone a little bit faster. I think next time I’ll go out I’ll try the track which has 180bpm as max and see how I get on with that. I think Darin is going to download the pyramid session so I’m intrigued to see how he gets on with that. If he likes it I might invest in that too so that I can change things around as and when I want to. So after just one session I am an interval convert thanks to AudioFuel! Yesterday afternoon I went to see my osteopath to have my orthotics fitted. I have low arches on both feet and have a tendency for my feet to roll inwards, or overpronate, and these things combined are leading to calf strain. This is being aggravated by my running and has the potential to turn into a pretty nasty injury so I’ve been really keen to get this sorted out. 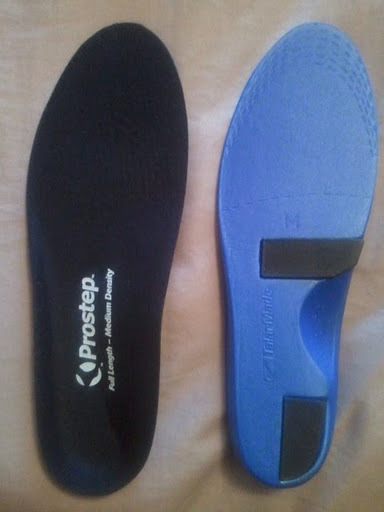 The orthotics are basically insoles which I’ll wear in my day to day shoes that help to correct these inbalances in my feet and should alleviate the strain that’s being placed on my calves. I’m not sure yet if I’ll need to wear them in my trainers, some already come with built in support specifically for people who overpronate so I may not need to wear the orthotics as well. I’m going to get a new pair fitted today at Runners Need – I’ll take them with me and see what they think. Fingers crossed this is the end to this particular niggle! Previous Week One – Done! Next Out with the old?